Genomic testing can be a useful tool in helping to ensure accurate risk stratification prior to selecting a treatment for patients with prostate cancer, says Stacy Loeb, MD. “Staging based on a single diagnostic biopsy does produce misclassification for a considerable number of patients. There are genomic tests available…that can give some additional information to patients on the biological aggressiveness of their cancer,” said Loeb, who presented research at the 2017 American Urological Association (AUA) annual meeting, examining one such test, Decipher. 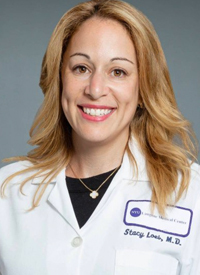 In an interview with OncLive at AUA, Loeb, an assistant professor of Urology and Population Health at NYU Langone Medical Center, discussed the promise and challenges with genomic testing in prostate cancer. OncLive: Can you please provide an overview of the study you presented investigating the Decipher test? Loeb: Active surveillance is a growing management option. The new AUA guidelines just said that it is the best option and is preferred for patients with very low-risk prostate cancer. This has hit the primetime. Unfortunately, the uptake has still been suboptimal in the United States. One of the concerns is that our risk classification of prostate cancer isn’t completely accurate. Many of the patients who are low-risk based on that first biopsy end up being misclassified. We wondered if we can have greater confidence in our risk classifications so that men know if they are really low-risk and are safe to just be monitored. The objective of our study was to look at using genomic tests as a way to confirm that patients are staged appropriately. Interestingly, we did find some discordance between the genomic test results and the patients’ risk classification just from the biopsy. Can you discuss those findings further? What we found was that 1 out of 5 patients who could be considered candidates for active surveillance—patients with low-risk disease or favorable intermediate risk disease—were shown to have high Decipher scores, which is a genomic test that indicates a greater risk of aggressive disease. This finding was concerning since it revealed that some of those men may not be appropriate for active surveillance. On the other hand, there were patients with intermediate-risk disease that had low Decipher scores and therefore had less aggressive cancers then what was suspected based on just their clinical risk alone. What impact do these results have on patients? The impact this has for patients is that we have a lot more testing options than we previously did. I think this is great news for patients, since we don’t have to rely on one single biopsy anymore. We have imaging tests, genomic tests, and other tests that can give us more data points. If a patient with prostate cancer isn’t sure which management option to pursue since they have borderline features, one of these additional tests is available and can be considered to help make a better decision. With all these new test options, how do you determine which test to give to patients? There are a few different genomic tests that are available on the market now for patients with newly diagnosed prostate cancer. One of those tests is OncoType DX. This gives the risk of finding adverse pathology if the patient had a prostatectomy or had their prostate removed. It tries to determine the chances of the cancer being more aggressive. There is the Prolaris test, which gives the risk of dying from prostate cancer in 10 years without any treatment. For a patient who is considering potentially deferring on treatment, this test will help them determine the chance they will die from the cancer if that choice is made. The Decipher test gives a few different endpoints, including the chance of the patient having high-grade disease, metastasis, or prostate cancer death. There are no studies to show that one of these tests is better than another, but the report does give a different type of data presented. Some patients may feel that one of the test results will be more helpful to them. What are the next steps for genomic tests following the results of this study? The next steps for this study are to follow-up the patients and see what happens in the cases where there was a discordance between the different tests. For example, if the biopsy looks like the patient has a very low-risk but their genomic test has a high result, what happens with those patients once they choose their management strategy and are followed in the long term? In other words, what is the best management for patients with discordant results on different tests. Also, which test is best to use for which patient? We now have MRI tests available, which is helpful for risk classification for patients, so we need to determine what the optimal use is for MRI and genomic tests. Are there any other remaining challenges that you would like to see addressed? One of the big questions is that since so many tests are available, which test is going to benefit the patients the most? The answer is not yet known, so many physicians are curious. Which patient should have an MRI? Which patient should have genomics? Which patients should have both? Nowadays, some patients come in and they request a specific type of test. Some patients want any possible test to help give more information, but we need to know what is going to provide helpful and actionable information and what is the most cost-effective sequence of tests.